OmPractice’s Yoga for Kids Teacher Tanya Farmer Shares Her Top 3 Teaching Tips Including Using a Bendy Stuffed Bear!When you meet the teacher behind Yoga for Kids at OmPractice, you’ll want to stop, drop and do some sun salutations. Tanya Farmer infuses fun and creativity into every yoga class to give kids the type of first-rate mind-body experiences she’s known for throughout the New York City school system. Brooklyn-based yoga teacher Tanya Farmer says when it comes to teaching yoga to kids, it’s all about grabbing their attention, even if it means pulling out your bag of yoga tricks–literally. “I actually have a bag filled with fun yoga tools,” she says. 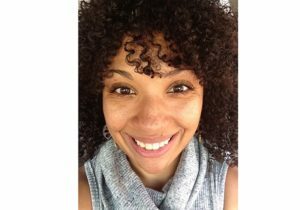 Farmer, who will soon lead children’s yoga classes for OmPractice, has taught yoga to preschoolers and New York City public school students from pre-K to grade 12, and also teaches hot yoga at Sacred Bed-Stuy and Y7 Williamsburg. Here, she tells us how teaching yoga to kids differs from teaching adults, and shares a few tips for making it meaningful and fun (think Burrito Pose). Q: How did you discover yoga? TF: I was introduced to yoga about 15 years ago when I was living in Massachusetts. I received a pass to take a free Ashtanga class at a local studio. The combination of postures and ujjayi breathing, breathing in and out through the nose, transformed me from that very first 90-minute class. I felt stronger physically and my mind was clear. After that class, I committed to a regular yoga practice. Q: When and why did you become a yoga teacher? TF: After practicing regularly for about five years, I was inspired to share this practice with others. Everywhere I went, I would tell people about the benefits of yoga. My yoga studio was offering a teacher training and I dove right in. I love everything about yoga: the philosophy, the dhyana (meditation), the pranayama (breathing), the asana (poses), the sangha (community). Q: How did you get into teaching yoga to children? TF: As soon as I started my first yoga teacher training back in 2012, I knew I wanted to bring yoga to children (Farmer is certified to teach to children and adolescents yoga through Yoga Foster and Kripalu Yoga in schools.) The essence of yoga to me is becoming self-aware and really self-loving. Far too often, kids are dealing with low self-esteem, stress, and bullying. This is not new, and children need skills to navigate it. I wish I had yoga as a kid! Yoga builds confidence and resilience. Physically, we know kids need to move more. 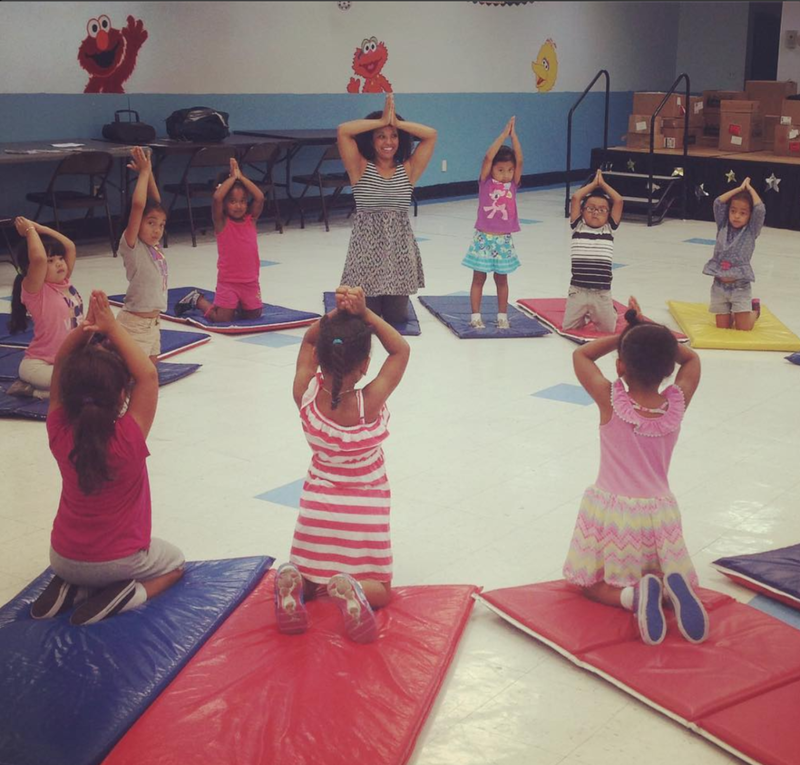 The yoga exercises can be made accessible to children of all abilities, and they develop body and spatial awareness, strength, flexibility, and balance. Q: What is different about teaching yoga to children, as opposed to adults? TF: Teaching yoga to children–especially young children–is very different than working with adults. For one thing, adults that take my classes want to be there! They paid $20 or $25 for a class, and they are committed to being there. They do everything I say. Not so with children! With children, classroom management is important. I also have to sell them on the benefits of yoga! Yoga is exciting to me, so I bring a lot of enthusiasm and I bring my bag of yoga tricks. For the most part, the kids love it immediately. Differing attention spans is another big factor to plan around. We’re not going to do an hour of asana practice with 5-year-olds. So I break the class up into 5-10 minute increments, including breathing exercises, standing poses with a song, yoga dance, mindfulness, seated poses, sharing circle, resting and guided meditation. And of course, I use my yoga tools: I have a Hoberman sphere, which is a children’s toy capable of expanding up to six times its original size. It’s great for demonstrating the expansion and contraction of the belly during breathing exercises. My Mind Jars, which are plastic jars filled with colorful water, glitter, and confetti, help children to be calm and focus. Breathing Buddies are small stuffed animals that can be placed on our bellies during rest pose. I also have Meddy Teddy, a bendable bear that practices with us and can demo poses. students can replicate the skills on their own. Allowing some time where the activities are self-directed is empowering. Q: Which poses (and creative pose names) do the kids love? TF: Tree Pose is by far the most popular pose. There are dozens of variations my students have created over the years, including Christmas Tree, Heart Tree, and Apple Tree. Falling Tree Pose and Windy Tree are favorites. One of the funniest poses a group of second graders created is Burrito Pose, where they roll themselves up in their yoga mat like a burrito! Q: What’s your favorite pose to teach to kids? TF: Partner poses are important, because they require great communication skills. Double Boat and See Saw pose are my favorite partner poses to teach, and demo! In Double Boat, the partners sit face-to-face holding hands with knees bent as they connect their feet, and slowly straighten their legs. It’s fun to watch them navigate it, especially if one partner is much taller or shorter. For See Saw Pose, the partners face each other in a straddle split holding hands or wrists, and connecting feet. One partner leans back as the other partner is gently pulled forward, then they reverse as they find their own rhythm. One innovative group of third graders discovered that these poses were not limited to pairs, and they demonstrated Triple and Quadruple Boat for their class. Q: How is OmPractice a game-changer for home yoga? TF: OmPractice gives me the ability as a teacher to reach new and old students that may not be able to make it to one of the classes I teach in studios or in schools. It also allows me to teach in multiple classrooms in multiple schools at the same time. Because of time constraints in the past, I’ve only taught at one school each school year. Through OmPractice, I’m excited to be a part of a global community of yoga teachers and practitioners. Q: Could you give us a sneak peek at what your OmPractice classes for kids will be like? TF: My children’s yoga classes with OmPractice will be an interactive combination of mindful movement, breathing exercises, and of course, yoga play!